Lets start with a bit of background: What happens when you start an application? The OS starts a process and assigns it a unique process id and allocates a process table.A process start an instance of DVM(Dalvik VM); Each application runs inside a DVM. A DVM manages class loading unloading, instance lifecycle, GC etc. Lifetime of a static variable: A static variable comes into existence when a class is loaded by the JVM and dies when the class is unloaded. Note that the value of the static variable will persist when you switch to a different activity of another application and none of the above three happens. Should any of the above three happen the static will lose its value. 3.Hit the back button and go to home screen. Note: Home screen is another activity. 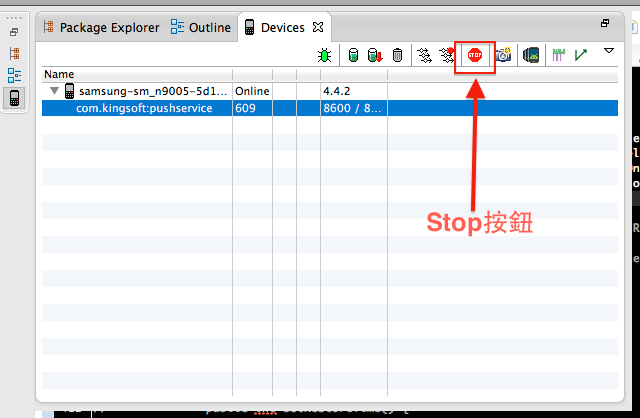 5.Kill your application process from DDMS(stop button in the devices window). 6.Restart your activity -> the static will have null value.